There are no adequate infrastructures to sustain the present MBBS students and faculty. In this circumstances such statement is like day-dreaming or the govt. is fooling the people. BHUBANESWAR: The state government is planning to increase the number of undergraduate seats in all three government medical colleges to 250 each, the highest possible intake for any college under the Medical Council of India (MCI) norms. However, the government has been struggling hard to meet the standard set for the existing capacity of 150 students in these colleges. Working on the principle that raising the capacity in the colleges instead of establishing new ones will save costs, the government has been pushing for the maximum seat possibiity. There are just 10 medical colleges across India with such peak ability. “The government will approach MCI to consider 100 more seats for Cuttack in 2013. A year later in 2014, it will plead for similar hike in VSS Medical College and Hospital Burla and MKCG Medical College and Hospital Berhampur,” said Dr P K Das, director medical education and training (DMET). Dr Das said the Cuttack hospital is almost ready for the increase in seats, while efforts are on to match the requirement in the two other colleges. The government will create additional lecture theatres, increase hostel capacity, create one auditorium of 650-capacity each and upgrade laboratories and libraries in these colleges. The state has to increase the bed strength in Burla and Berhampur hospitals to at least 1,190 as per MCI norms for 250 MBBS seats from the current 800 and 1,081 beds respectively. The Cuttack hospital has a bed strength of 1,600, which exceeds the minimum bed requirement criteria for 250 seats. Dr Das said after infrastructure upgradation, there should not be any big huddles in increasing the number of seats. “We don’t have to worry much about faculties, except for filling up existing vacancies as the sanctioned strength is not far short of meeting the criteria for the proposed expansion. The government is taking steps to fill up the vacancies on a priority basis,” the DMET said. If new medical colleges are established for 300 seats, the government will incur a cost of Rs 1,100 crore. But by spending Rs 450 crore on upgradation of infrastructure in existing colleges, the government can produce 300 more doctors every year at a 40% cost, said a senior officer of the DMET. Notably, the government increased MBBS seats in SCB Medical College from 107 to 150 in 2006 and made similar increase in VSS and MKCG after a year in 2007. The MCI last year gave its final recognition for the increased capacity in SCB Medical College. However, it is yet to give its permanent recognition to the two other colleges. Though MCI inspection for permanent recognition in these two colleges is due in February-March, the government is still struggling to fill up largescale vacancies in the two institutions. In Burla, around 60 of the sanctioned 163 posts in clinical disciplines are lying unoccupied, while over 20 of the 79 non-clinical posts are vacant. “We have written to the government to fill up these vacancies before the MCI inspection,” said Dr Santosh K Behera, principal of VSS Medical College. Similar largescale vacancies mar the MKCG Medical College and Hospital as well, sources said. “We have around 50 vacancies of faculty members because base level posts of assistant professors could not be filled up for long. Now, the process has started again. We will shortly fill these vacancies,” said Dr Sunamali Bag, principal of MKCG Medical College. Hopefully by another year, the infrastructure for the proposed expansion too will be ready, he added. 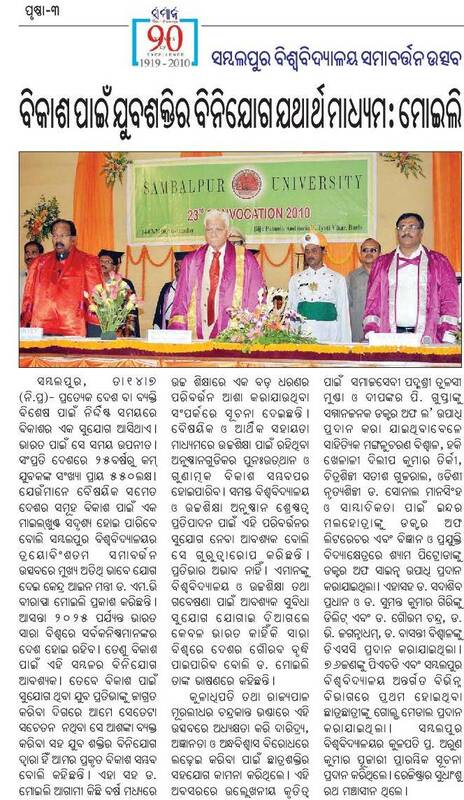 It was very sad that a bunch of fools from western Odisha were opposing the then VC of Sambalpur University Prof AK Pujari while he was trying to introduce UG cources in Jyoti Vihar. The so called activist-fools are not aware of the fact that all most all successful institutes in the world (from IIT to MIT) have UG courses in their campuses. Universities are not merely for PG and PhD courses. A bunch of fools in western Odisha are hurting the growth of the region. Bhubaneswar, Dec. 14: TheUtkalUniversity is planning to introduce BTech programmes in nanotechnology, robotics and artificial intelligence in its proposed engineering college. There will be 30 seats for each discipline. The decision was taken at the syndicate meeting that chalked out an action plan for establishing “the centre of science and technology” within a year, under which all the new courses will run. A committee, led by professor Trilochan Pradhan, has been assigned to conduct a “feasibility study” for the courses. The committee will also prepare a project report, including infrastructure and faculty requirement. “Instead of the traditional branches of engineering such as mechanical, civil and electrical, the university will begin with cutting-edge technologies such as BTech in nanotechnology, BTech in robotics and artificial intelligence under its upcoming engineering college,” a senior official of the university said. “Over 25,000 seats are lying vacant in engineering colleges across the state. But seats are not going vacant at the Indian Institute of Technology or the National Institute of Technology. It’s high time we cash on the brand of the university. All the courses will be offered at affordable fees as emphasis will be given on maintaining quality and not earning profits,” he said. Senior faculty from the departments of knowledge engineering, physics, and chemistry will be initially engaged for the courses. The university is also exploring possible tie-ups with other premier technical institutes to pull in the best experts for its new school. “A centre for science and technology will be opened and all the BTech disciplines will be brought under its fold. Since the construction of the centre will take time, we plan to make use of the space at the department of pharmacy and start the courses by the next academic session,” the official said. Discussions were also held on launching of courses of food technology and agri-management. The university vice chancellor had, earlier this month, announced the launching of an engineering college on the varsity campus. While aiming for introduction of more courses, the idea behind launching these courses was to generate funds for maintenance of the university, he said. Bhubhaneswar-based Xavier’s Institute of Management (XIMB) is in the process of turning into a university soon, its Director Fr PT Joseph, SJ tells PaGaLGuY. In this interview, he also speaks about the curriculum changes the institute is planning for its Post Graduate Diploma in Management (PGDM) and the PGDM Rural Management courses. What changes can the incoming batch of 2013 look forward to benefitting from at XIMB? From the point of view of the fulltime programme students, we will be revising the curriculum a little bit next year. Apart from that, although it doesn’t directly affect PGDM or PGDM(RM) students, but we have started a 1-year advanced management programme on Resettlement and Rehabilitation and Corporate Social Responsibility for 15 executives of Uttarakhand’s Tehri Hydro Development Corporation. This along with our other initiatives in the rural management and social sector will continue to be under focus in the coming year. Are you looking at an increase in intake for any of the the two-year programmes? We were looking at expansion in the number of seats but the proposal hasn’t gone past AICTE’s regulations. But we may become a university soon and therefore increase intake from a university perspective. That process might take one or two months to finalize, but we are in the process of becoming a university. Would that mean that the PGDM degrees would be offered as full-fledged MBA degrees under the XIMB University? The PGDM will still remain as an AICTE-approved course, it may not become a university degree for now. But after we get university status we may start some other type of programmes under the university. Right now we have gotten the government sanction of Rs 10 crores and are involved with acquiring the necessary land for the University in Sambalpur. Until land is acquired, which is priority for now, we aren’t in a position to share more details. What is XIMB’s faculty strength now and how are you thinking about expanding it? As of now we are 55 in total. One more is joining in December and another two may join in January 2011. We hire faculty whenever we come across somebody good. For example, one of the faculty joining next is a Cornell University PhD with lots of experience. Another person in the recruitment process has worked in Netherlands and has a PhD from Korea. What kind of curriculum changes are you going to make in the PGDM and PGDM(RM) courses before the next batch joins? We have already started a new course on Environment and Sustainability which is mandatory for all the 180 PGDM students. There’s another mandatory course on Emotional quotient and Leadership. Next, we are planning a meeting of all the faculty on the January 12, 2011. Before that meeting, a committee is preparing the background papers by looking at changes in the global and Indian economy. Only after the January 12 meeting will a clear picture emerge about the exact changes. But speaking in general, we’ve been teaching management that is too bifurcated by specialization in our view. As you know, students choose to go for either marketing or finance or other specializations during the course. We are having a feeling that there should be some integration between these specializations by changing their content and give each course a holistic approach. For example, we know that there is a good market for inkjet printer cartridges. But inkjet cartridge production also generates a large amount of waste and affects the environment. So when we teach either of marketing or production management, we need to also bring awareness of sustainability in and show how both marketing and production are linked. If we can do this, we will not only make better managers but also better human beings. Apart from that, we would like to increase our connection with the bottom of the pyramid. We have a very strong programme in which all 180 PGDM students went and stayed in villages for 3 days. We want to increase their exposure to bottom of the pyramid and to leadership. We would also like to focus on ways to increase mentoring from faculty and senior students. What are your thoughts on b-schools changing their admission policy to reduce the number of engineers in the batch? This is something we tried to do last year already. We wanted to bring down the number of engineers and increase the batch diversity by taking in students from other backgrounds. But unfortunately all the students who are getting good grades in XAT were engineers and we could not reduce their number last year. But we’ll continue to give quantitative ability lesser weightage compared to verbal and commnication skills and try to reduce the number of engineers. Looking at the Indian scenario, I would prefer 60% engineers and 40% non-engineers ideally in the XIMB batches. The job market requirements are still such that the engineering background is preferred so we cant reduce it too much. We have traditionally seen what an engineer-driven MBA job market looks like. But in your view what scope do non-engineers with an MBA degree have in the market? Only the product marketing, production and manufacturing companies need people to necessarily have engineering backgrounds. But the remaining type of jobs, that is finance, human resources, some types of marketing and market research, advertising are areas that do not really require engineers. SAMBALPUR: The privatisation and outsourcing spree has not spared Sambalpur University either. If the varsity authorities have their way, students will soon find their examination and evaluation done by a private agency. And this has stirred up a hornet’s nest. The student community and the intelligentsia expressed strong resentment at the move to outsource examination. The university is planning Integrated Examination Management System under which a private agency will be hired. The agency will look after all the exam-related activities __ registration of examinees, admit cards, setting question papers, valuation of answersheets and issuing provisional marksheets. The system is to be implemented at the university’s 220-affiliated colleges, besides various departments. Once implemented, this would effectively end the work of six examination cells, six confidential cells, one private cell and one distance education cell that are involved in conducting examinations of around 65,000 students every year. Sources said three south-based IT firms __ Mind Largx Infotech Limited (Bangalore), Merit Trac Services Private Limited (Bangalore) and Om Shanti Soft Solution Private Limited (Hyderabad) had evinced interest in the project after the varsity floated a tender in July. Although university authorities have not yet finalised the deal, the move has led to public outcry. 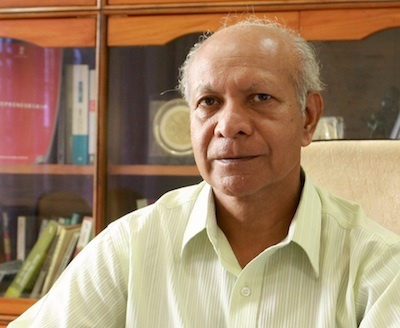 Former Vice-Chancellor of Berhampur University Prof A P Padhi and All-India University Employees’ Federation president Bhawani Hota have asked the authorities to first evolve a consensus. University syndicate member Karunakar Supakar said he would raise the issue at the syndicate. The decision has also come in for stiff opposition from Sambalpur University Employees’ Association, All-Koshal Students’ Union, Sambalpur Chhatra Vikash Parishad and Sambalpur unit of NSUI. The NSUI, led by district president Debasis Dash, held a meeting on Saturday and resolved to launch a stir if the decision is not withdrawn. However, university Registrar Dr S S Rath said the proposal is at nascent stage and all aspects will be looked into before taking a final decision. How will innovation universities change higher education? We have not adopted a top-down approach, ours is a bottom-up one. So far we have spoken of inclusive agenda of development, we are now thinking in terms of an inclusive education agenda. The idea is to empower institutions at the base of the pyramid. State universities are the foundation of higher education segment. State universities need to have greater freedom so confirm to realities of 21st century. The Centre is willing to give a helping hand. Is that all required to improve institutions? There is proposal to help state universities, which make up bulk of higher education segment. The Centre can help by giving more funds to strengthen these universities. This would help build infrastructure and quality. But state governments need to step up and provide policy framework. This framework will give universities more freedom. UGC can make grants beyond what it already does. But state governments must allow for more freedom so that state universities can transform themselves. Are state only expected to provide for a more liberal policy framework? Over the years, the Centre’s share of expenditure in public education has increased, while states’ share has come down. This mismatch should be corrected. There should be democracy. An institution should have the right to decide on what basis it wants to admit students. At the same time there should not be unnecessary pressure on students. So some institutes can decide to admit on the basis of Class XII results — on the basis of merit. While other institutes could admit on the basis of the national aptitude test, or look at the aptitude test as an add on. There is also the option of add on subject tests. So the class XII results determine subject knowledge, aptitude tests will assess raw intelligence, and add on tests will assess special knowledge. So each institute can determine the basis on which they admit, rather than doing so through individual entrance tests. The idea is to reduce tests, while still giving each institute the freedom to admit students that fit in with the specific focus of the institute. Let me give an example, what is the difference between Yale and Harvard law Schools. Yale is focused on research while Harvard is more business minded, so corporate law is a focus. So in their admissions policy they would show a preference for those who fit in to their respective focus areas. Will this make the education system more inclusive? Right now we have entrance exams to exclude students, to keep some people out. I want to reduce stress for students, but also exclude exclusion. If we were a more mature system, I would say that interviews would be the final basis of deciding who gets admitted and who doesn’t. But we are not mature enough. Allowing for discretion would not help. So I want to put in place a system that doesn’t give space for discretion.